Google+ Mom to 2 Posh Lil Divas: Edible Ladybugs & Flyers, Oh My! Edible Ladybugs & Flyers, Oh My! The Very Lazy Ladybug is a cute book about a ladybug that is so tired she doesn't even know how to fly. We follow her on her quest to find the perfect place to sleep. Finally, an elephant's sneeze launches her into the air & she has to fly! 1. Color the circle (ladybug body) in the color desired. 5. Once ladybug is dry and firmly affixed get ready to fly (blow)! Finally, what do you do after you're tired from flying? Refuel w/a snack of course! 4. Use half of a toothpick to attach grape (head) to body - I just let mine sit in front of it as the girls were going to eat it right away anyway. That's it! Easy right? Yet, such a kid friendly snack. That looks like so much fun. I'm a kindergarten teacher and those would be all fun to tie into the book! BTW-found you on the Welcome Wednesday blog hop! found you through aseedinspired just comment hopping. anyway, such a CUTE idea with the strawberry ladybugs. so sweet just like your girls! Oh my! How adorable are these? I just love how you can make the ladybirds fly! too cute! You are a clever lady! Love the edible ones too.. So cute! My little one LOVES ladybugs. I can't wait to make the strawberries for him! love the snack idea....my daughter will love it! I can't wait to surprise my daughter with the edible ladybugs. She LOVES ladybugs. She will be so surprised and excited. I am currently in school to be a teacher and I love these ideas! Thanks for sharing! How clever and simply adorable too. We love ladybugs and enjoy the story that Eric Carle wrote about the Grouchy Ladybug. You story looks good too. I will have to check it out. Have a great weekend! We made rockets like that a little while ago. I like the ladybug twist. These are so cute. 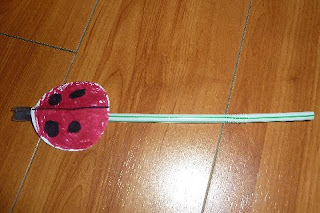 JDaniel would love to blow on a straw and watch a ladybug fly. Gotta save these strawberry ladybugs for my Strawberry week next year: http://www.brennaphillips.com/?s=strawberry+week and Delaware week since the ladybug is the DE state bug: http://www.brennaphillips.com/know-your-state Great ideas! Thanks for linking up at Feed Me Books Friday! 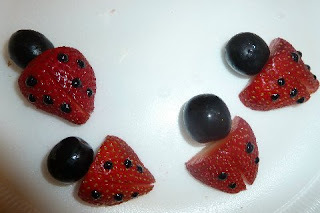 Love your lady bug snack - lady bugs and strawberries are both pretty popular in my house! and we happen to have some fresh strawberries! i'm thinking we'll use some mini chocolate kisses pushed into the strawberries for polka dots- i guess we may have to sorta heat up one end to get it to stick....... hummmmmm- or a dot of icing! Those are the cutest ladybug treats! So wonderful.